Heidi: I know the band has a particular aesthetic, did they have any requirements? 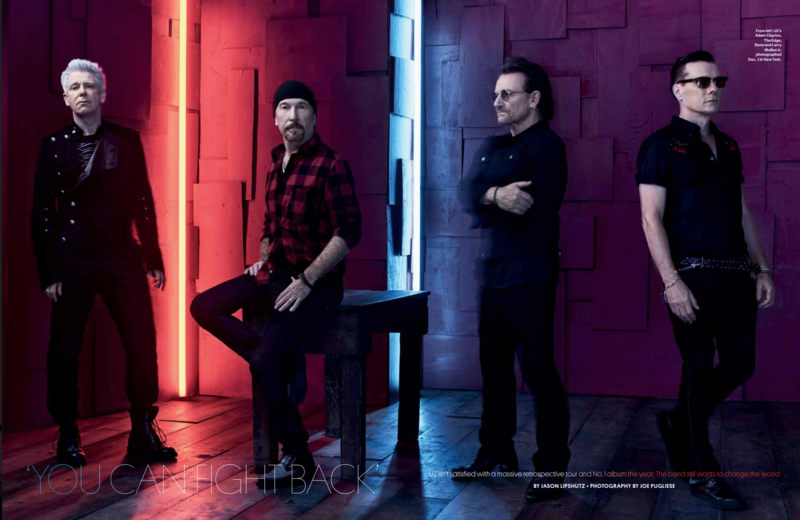 Joe: Since this was my third shoot with them, I have sort of gotten to know some of their preferences, but having said that I think they probably prefer to be surprised and maybe like to hear that the photographer has good ideas. It’s hard to know what to expect, which makes it fun and challenging in equal measure. The band has been heavily photographed, did that fact play into your approach for the shoot? Did you want to do something different that hadn’t been done before, is that even possible? For sure, they have not only been photographed by all of the top music and portrait photographers over the last decades, but the sheer volume of shoots they have done have made it hard to think that you’re going to wow them with anything that you do. It helped me to not try to mine the archives for inspiration and/or for things to avoid, and just approach it honestly as I would any other shoot. In the end I just wanted to make interesting photos and I wasn’t too hung up on whether it had been done before. I’m not a high concept photographer, and since I started my career in photojournalism, it’s important to me to just build a world they can be in and shoot organically once they are in it rather than have exact compositions and arrangements in mind beforehand. What made this shoot unique as you’ve got a stellar gallery of subjects. 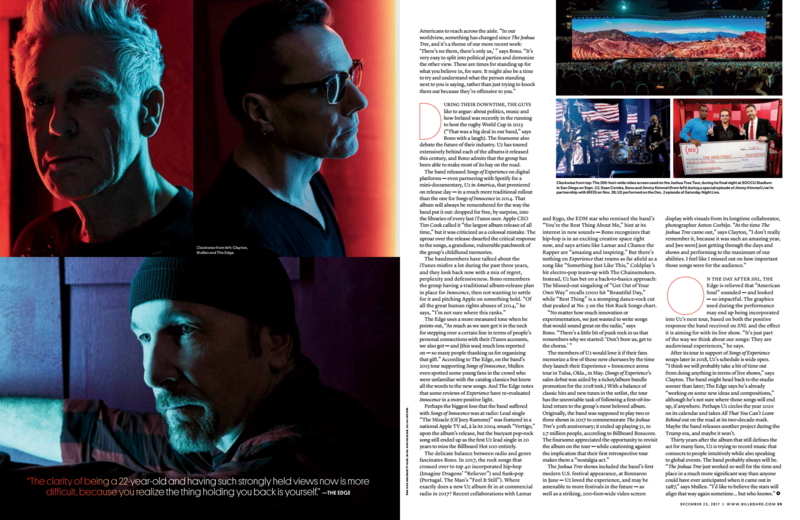 The most unique thing about shooting U2 is how much I respect their creative output and the fact that Bono especially is incredibly involved in the process (in a very good way). He’s a tough critic and it can be hard to hear when he doesn’t like something, but it always leads to better images because he cares enough to communicate what he thinks is and isn’t working. The challenge of this of course is that if the magazine is not involved in this conversation, a cover edit can be made that does not align exactly with the band favorites. It puts me in a difficult situation because while I definitely take their preferences into account, the magazine has other needs and we can’t kill an entire setup if it’s not the band’s favorite. 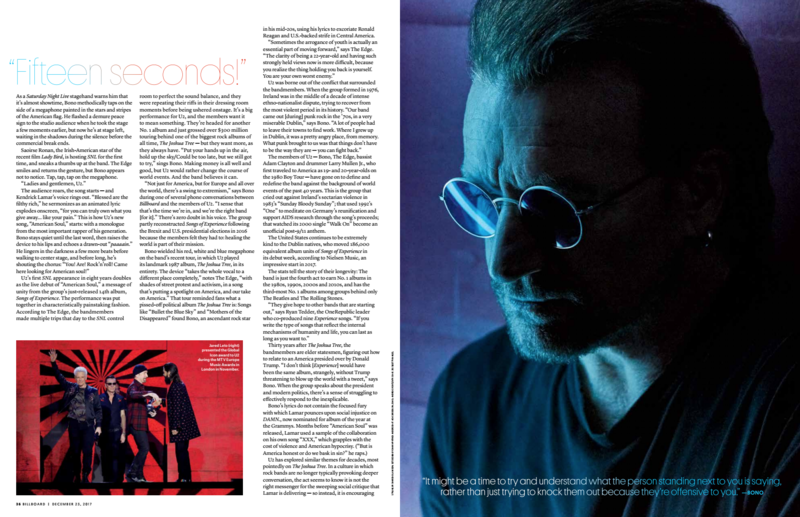 The previous shoot I did with U2 was for their own publicity and they had final say in the images, so I think it was a bit of an adjustment to shoot again for editorial where the magazine really had final say in cover choice from what we shot (and what I turned in). Did you play music on set? Haha. Good question. 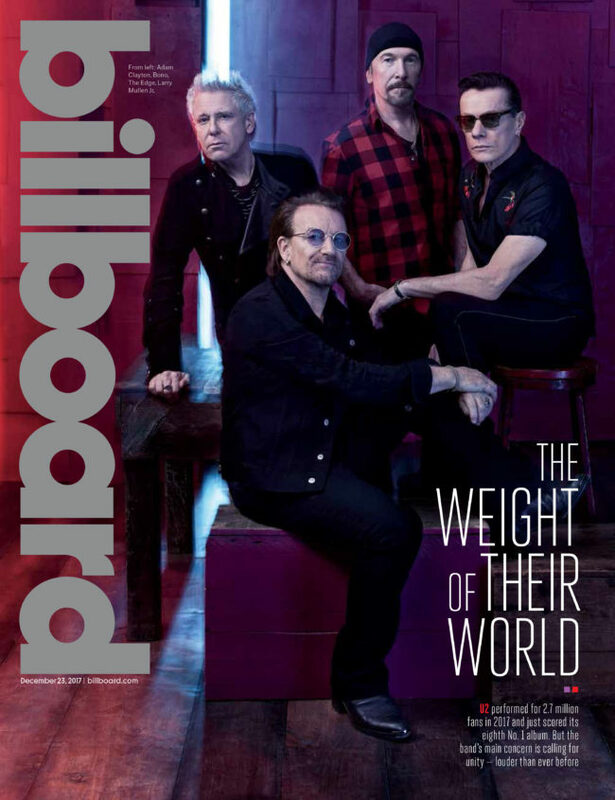 It’s definitely not easy choosing music on any set, but music legends make it even tougher. When I showed up on set in the morning the props department had already put on a U2 Pandora station that was fun for a few minutes but obviously the last thing we would ever play during the shoot! Luckily one of my NYC assistants makes amazing Spotify playlists and we played a mix of classic R&B and funk that seemed to work well. How long did you have with the band; what was your interaction like? I started conversation with Jenny Sargent, the photo director at Billboard, and discussed some approaches to the shoot. Jenny suggested that we work with the set designer Shawn Patrick at Acme Studios in NYC and he and I came up with some great ideas together. I would start on an idea for a look and he would riff on different ways to achieve it and we went back and forth from there. He was really key in putting together some of my loose ideas and making them into the final set we ended up with. Even on the day of the shoot we tweaked the set and he made suggestions to make it have more depth, etc. He suggested a single neon light in the background and together we decided that two vertical lights of different colors could provide us with a lot of options especially for the singles. It’s fun to be open to collaboration on something like this, I feel that if I was too rigid about my initial ideas, I could have missed out on some of my favorite images of the day. Really nice to get some insight on this shoot. Amazing work as always, Joe!